The bulls do have several potential patterns in play here -- one possibility would be for the entire move off the all-time high to be a fourth wave triangle. If we followed that pattern to its logical conclusion, then it's technically possible for 2144 to mark the bottom of wave e of that triangle, and head straight up to new ATH's from here. I'm not favoring that, but it pays to be aware of such things, especially at inflection points (one of which was just reached). In conclusion, I'm still inclined to favor the bears heading forward, but bulls do have near-term options to add additional confusion to the pattern, and larger options for a more meaningful rally. Hence, yesterday's target capture signaled a reasonable inflection point for bears to begin behaving at least somewhat cautiously. 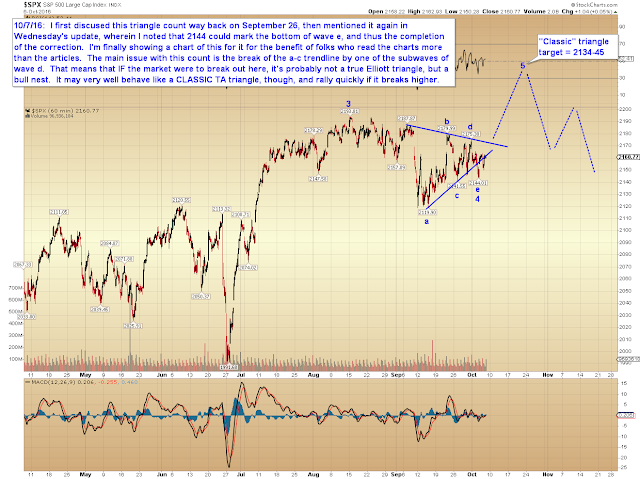 Since then, BKX (banking index) has made a new high for this move, and that calls for added bear caution. 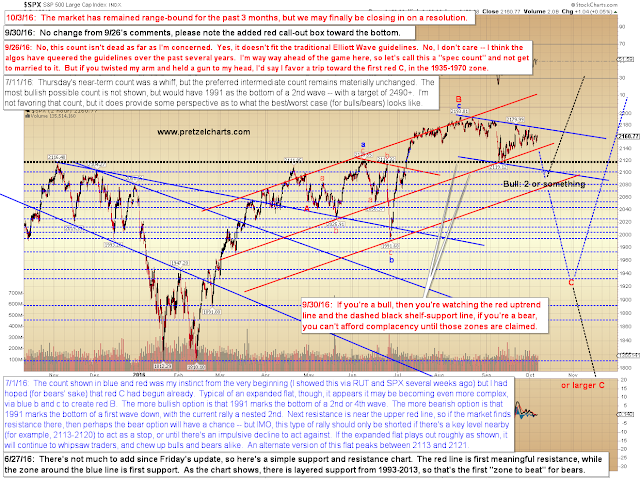 Thus, today's update will chart both a bull and a bear count. We'll start with a chart of the bull count, since I have only discussed this verbally in prior updates. Please note the typo, wherein the target should be 2234-45 (obviously). The bear count is unchanged. In conclusion, although SPX has remained range-bound for quite a while, and although we closed smack in the middle of that range yesterday, my gut tells me that we may finally be close to breaking the range. As mentioned, BKX made a new high yesterday, and that at least calls for bears to continue to maintain the cautious stance recommended on Wednesday, until such time as the market can sustain a break of the red trend line shown on the chart above and, more importantly, break down from the trading range. Whether one is a bull or a bear, whenever dealing with an ongoing range like this, one should choose all entries and exits very carefully. Trading ranges can be unforgiving of sloppy entries, and even one bad entry can throw off your entire rhythm and cause all subsequent trades to be unbalanced, leading undisciplined traders to be whipsawed out numerous times. Trade safe.